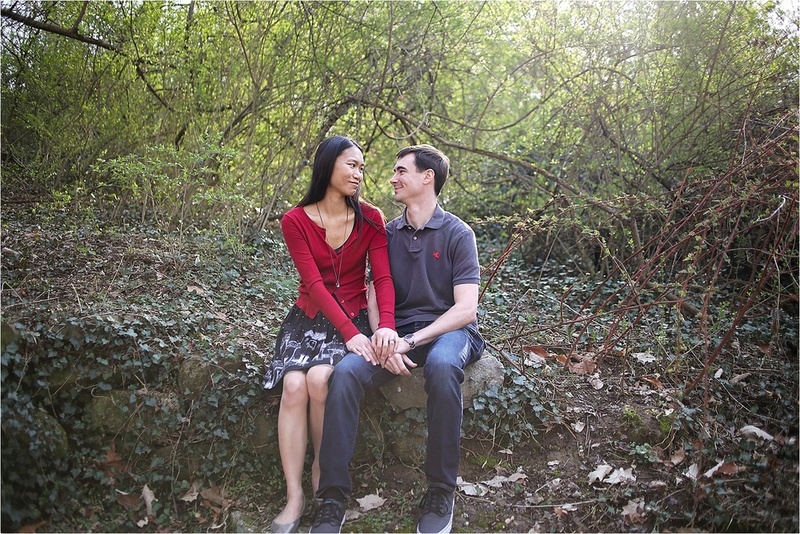 Alfred and Ina had the best timing ever – their trip to Blacksburg to meet up with their wedding vendors and have engagement photos taken happened just as the trees started to bloom in the spring. I’m not sure if they were as excited about it as I was, but sweet little cherry blossoms melt my heart into a little puddle every year. We began at the Hahn Horticulture Garden, their wedding venue and worked our way around campus. Down by the Virginia Tech Duck Pond I learned that Ina lived in Blacksburg as a child also and she used to play on the very same rickety tree that used to be beside the pond (that was sadly chopped down years ago) as me! Ina and Alfred met when they were students at Virginia Tech, but were from the same area, Ina actually used to be in the same class as Alfred’s younger sister. I just photographed their wedding a couple of weeks ago so check back soon to see those photos as well, her Vera Wang wedding gown was AMAZING, you won’t want to miss it!